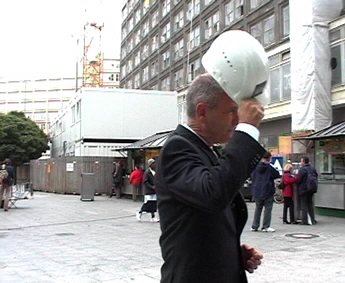 The work was shot in Berlin surround by the redevelopment of the train station and shopping mall in Alexderplatz. I work extensively in London (Kings Cross) and Berlin (the East part) on pecific locations, such as construction sites and city re-development project areas. The works are based on the social and political investigation of contemporary urban myth ­in order to understand the world we live in. By developing a series of moving image works on deconstructing and reconstructing the city landscape, I intend to recontextualize the historical utopia of the city within a post-modern environment of discontinuity, fracture and re-assemblage. Most of my works are unscripted made from my witnessing various events happening in the city. Such as the broken water pipes in River Islington and tram rail reparation in Spark re-justify the failure of the city, in which I interpret disorderliness as appreciation of sublime beauty in the darkness. Looking beyond the system of the regulation, both works create extraordinary experience of the illusionary nature for the viewers. Reconstruction (Alexanderplatz) and Lenin Never Died (the Red Square) examine the reality of past and present geo-political significance in Berlin and Moscow. Both works respond to past historical and political background of the localism, and contrast it against their moves towards consumerism and tourism. Yu-Chen Wang (b.1978 Taiwan) lives and works in London. She studied at Goldsmiths College, London (2000-01) and Chelsea College of Art and Design, London (MA in Fine Art 2001-02). She has exhibited across the UK and Europe, including tent, Podion Gallery, Amsterdam (2002), Tank.TV, ICA, London (2004), Caution, Uneven Surfaces, temporarycontemporary, London (2004), Media Art Festival Friesland (the Netherlands 2005) and Synch Festival in Athens (2005). She was shortlisted for the Guardian/Observer Award (UK 2002), the Pizza Express Prospects 2004 Drawing Prize, UK (selected by Tim Marlow) and The Vauxhall Auteur Theory Film Competition 2005 (Curzon Soho Cinema, London 2005, ICA, London 2006, Clermont-Ferrand Short Film Festival 2006). Her video works has recently be screened on the Bigger Picture, BBC Big Screen, Manchester, curated by Cornerhouse (April 2006) and will be shown at ArtBreak at Federation Square, Melbourne, Australia (2006), Conjunction 06, AiRSpace, Stoke-on-Trent, England (2006).